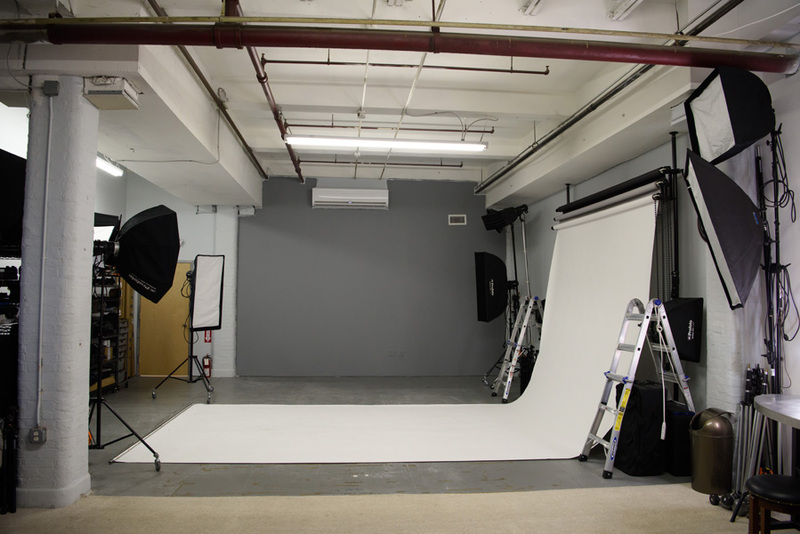 This large photography studio space, located in Little Falls, NJ, is available for hourly and daily rental. 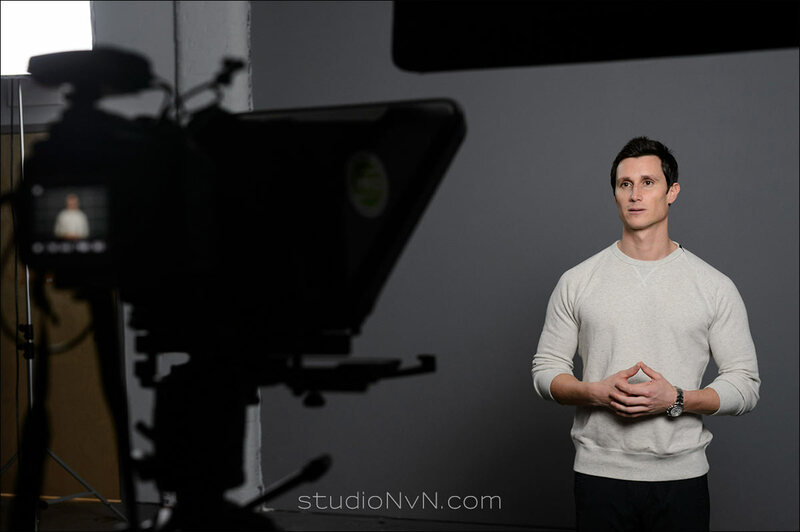 The studio is 1,000 square feet and has an extensive studio flash system, as well as continuous lighting gear – all available for use in the studio. The image above only shows a partial selection of the studio equipment. In addition to that, the area around the studio is (usually) available for a more urban look to your photos. This helps extend the possibilities that you can achieve, varying the look of your photographs. I will be on hand to help you on the day of your shoot with initial setting up of gear, and to show you around. If I am not available, my assistant will be able to help you. Check the studio calendar for availability. 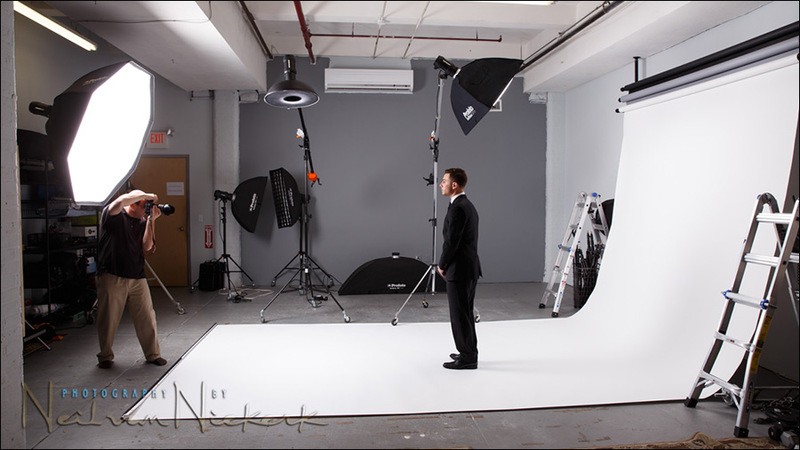 Get in touch with me if you’re interested in using the studio space – I’ll gladly show you around. 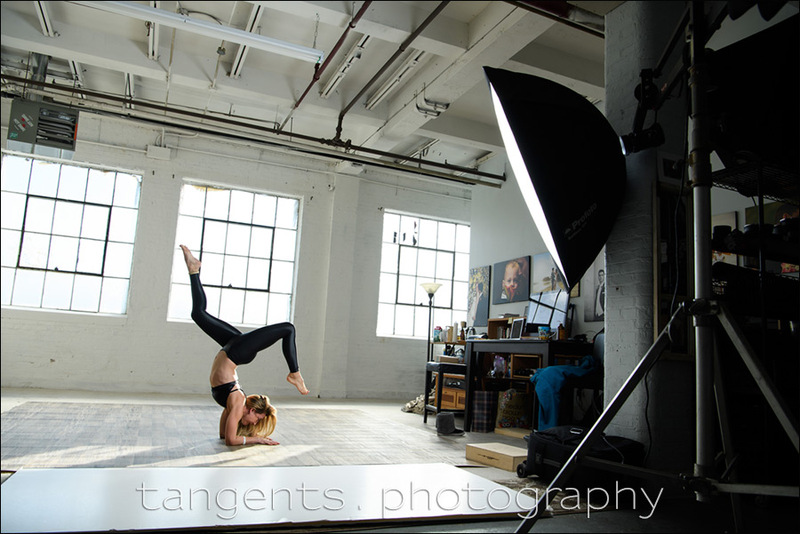 The studio is a loft space on the 3rd floor of a warehouse area in Little Falls NJ, and it is within easy reach of Rt46 and Highway 80. There is free parking. – minimum of 4 hours / $200 for weekend dates. and will be billed accordingly. $50 if you clean it up, or $100 if I clean it up. For contiguous days (of 6+ hours per day), the 1st day is at the listed fee. The second and further contiguous days are then discounted by 33% of the fee. Check on the Calendar to see if the date is available. Then confirm the date with me before paying the reservation fee. This fee will count towards your final fee payable on the date. $100 non-refundable studio reservation fee to secure your date. Please note: in paying this studio reservation fee, the time is blocked out exclusively for you. This means that I can’t book the studio out to other photographers for the same period. Hence, this fee is not refundable. 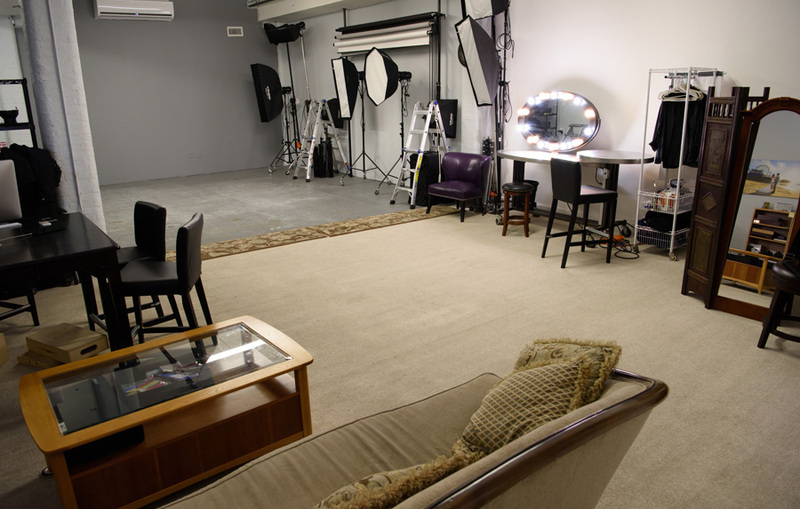 The studio is available to anyone who has a photographer or is a photographer. However, if you don’t have a photographer for your shoot, I could help. If you’re looking for someone to photograph fashion catalog, or a headshots and portrait photographer, or if you need a commercial photographer, please contact me. The total floor area is 1,000 square feet, of which half is carpeted. There is a Bose soundlink for iPods and other music players. There are huge windows with lots of available light. Access is via stairs to the 3rd floor, but there is a freight elevator if needed. There is a fridge stocked with water, and there is a Keurig coffee maker. 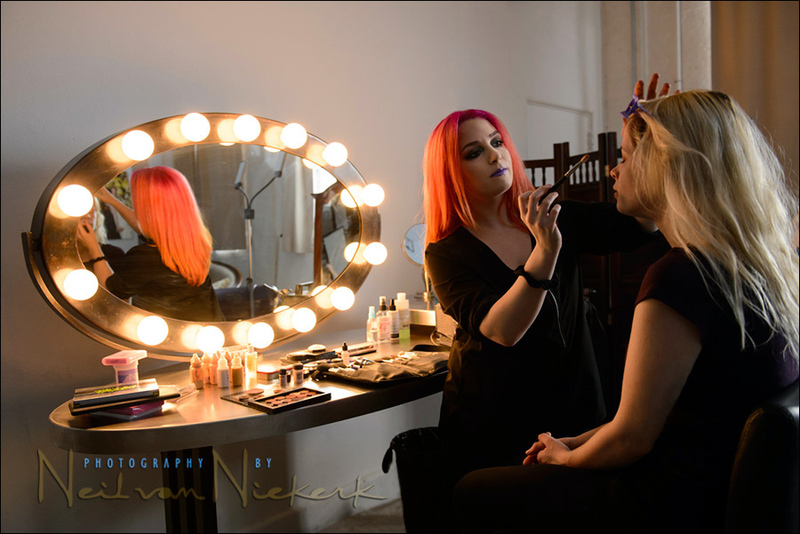 A large lighted make-up table is available for hair and make-up artists to use. and heating to have the studio nice and toasty in winter. There is a wind-machine if you want that wind-swept look for your subjects. There is an hand-held steamer for clothes. Use of the stu­dio and equip­ment is at your own risk. (I will be on hand to help you show you the equipment, and help set up the equipment if needed.) By hiring the studio and equipment, you waive any rights to seek legal redress for mis­haps, acci­dents, and/or loss related to their actions whilst on the premises. Health and Safety – neither myself, (dba One Perfect Moment), nor the stu­dio will be held respons­ible for any acci­dent or injury caused by you or any mem­ber of your party whilst using the stu­dio facilities. You’ll agree to leave the stu­dio and adja­cent grounds in the same con­di­tion as they were when you arrived. The equipment is in good work­ing order, but I make no spe­cial guar­an­tee as to the equipment’s func­tion­al­ity or suitabil­ity to your intended pur­poses. I will not be held responsible for limits on, or loss of space usage due to acts such as: power outage, weather conditions or emergency. In such cases, I may refund or credit a pro-­rated por­tion of the pay­ment. Dam­ages to equip­ment and premises are your responsib­il­ity and must be settled after rental period, at mar­ket value. – 3 of the lights are set up on boom arms for better positioning. – all 6 lights are on light-stands with caster wheels. Computer & screen. You need to bring your own. Cameras and lenses. If you need to rent specific camera gear, Unique Photo is only a few miles away, and has a large selection of cameras and lenses available for rent. The large lighted make-up table for the hair and make-up artist to use. There are also hand-held and wall mounted mirrors. There are two fans / wind-machines available for that wind-swept look. The large Profoto 5′ Octa on the boom arm in the foreground (on the right). In the background you can see the three windows that let daylight flood into the studio when the curtains are taken down. The curtains are usually up to keep the studio suitably dark for most photography needs. 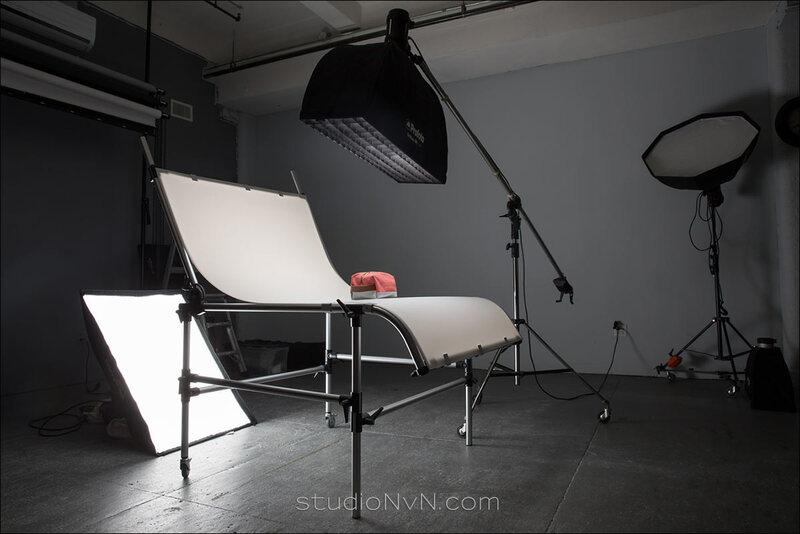 There is a large white product photography table available. Dramatic lighting is possible with the help of gridded stripboxes and V-flats. 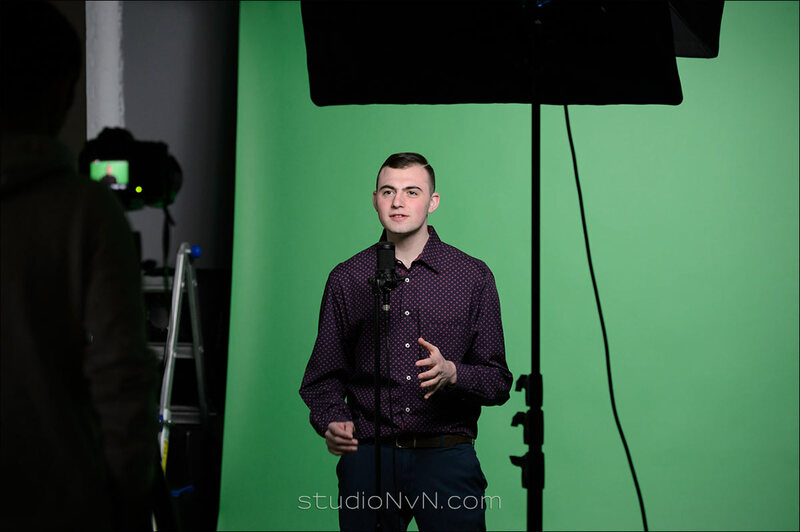 For smaller projects, we can also accommodate you if you need to chroma-key a different background in to your photos or video via a green screen. There is an iPad teleprompter for smaller video productions such as Youtube clips or promotional pieces.